There’s no mystery surrounding what bike BMW targeted with its all-new S1000XR. An Adventure model sporting a Superbike-derived engine, top-shelf suspension and braking components, all of which are enhanced by cutting-edge electronics. It all sounds very Ducati Multistrada-ish, doesn’t it? And while it might be terribly bad form to drone on about another manufacturer’s bike while reviewing its exciting new competitor, the Multistrada demands mention for its impact on the large-displacement Adventure segment. The redesigned 2010 Multistrada completely upended performance expectations with its 160-horsepower Twin and sporting chassis. The Ducati could get dirty too, if it really had to, but the Italian ADV bike was so much more sportbike than adventure-tourer that it wasn’t really a true Adventure bike at all. Instead it carved out a sub-niche of its own. 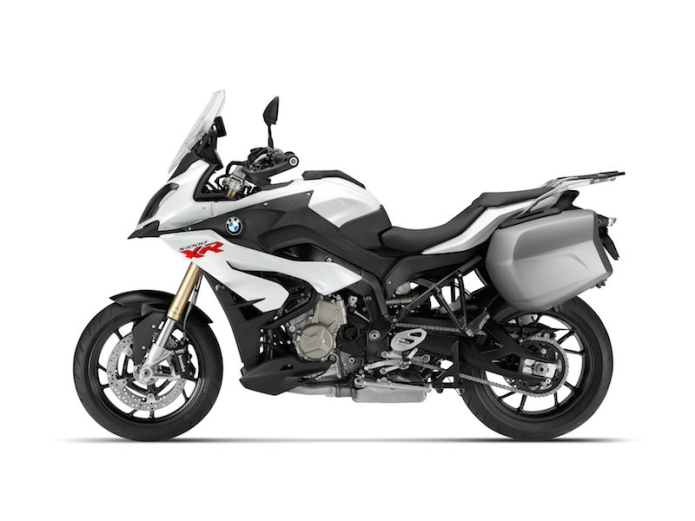 BMW bills the S1000XR as an “Adventure Sport” – the best descriptor I’ve heard for this not-quite-true-ADV segment – and it takes dead aim at the Multistrada. A sophisticated electronics package harnesses the XR’s engine power, as well as integrates actions from the traction control, braking and suspension. The various electronic systems and the manner in which they weave together is confusing to explain (or at least it is to me! ), so my apologies for the technical weeds I’m about to drag you through, but here goes. The base model XR ($16,350) comes with two Ride Mode settings: Rain and Road. The standard XR also includes BMW’s familiar ASC (Automatic Stability Control) system and semi-integral ABS. Rain mode softens power delivery and mellows throttle response, with the ABS and ASC setup for quick intervention on wet roads. The Road setting delivers the XR’s standard 160-hp dosage of power, with the traction/braking aids calibrated for dry roads. Things get interesting, and more complicated, with the Ride Modes Pro option. Offered as a stand-alone $450 upgrade or included in the $2400 Premium Package, Ride Modes Pro adds Dynamic and Dynamic Pro to the Ride Mode setting options. Ride Modes Pro also replaces ASC with the more advanced DTC (Dynamic Traction Control) and likewise upgrades the standard-issue ABS to ABS Pro – with the XR being the first BMW, besides the HP4, to offer ABS Pro as a factory option (though it is now offered on other 2016 models and as a retrofit on previous select models, like the RR). The Dynamic Ride Modes offer the same 160 horsepower as the baseline Road setting, but uncork the throttle for more immediate responsiveness. The bigger differences in the Dynamic Ride Modes are intervention settings for DTC and ABS; with Dynamic permitting limited rear-wheel spin and slight front wheel lift, while Dynamic Pro has a higher tolerance for wheel spin and doesn’t suppress wheelies at all. (The DTC/ASC and ABS can also be manually disengaged in any Ride Mode setting.) The Dynamic Ride Modes also enable the Dynamic setting for the Optional Dynamic-ESA… but let’s save that suspension discussion later. Confused yet? Well, let me muddy things further. My test bike at the XR press introduction, held in Muskoka Lakes, Ontario, featured the Ride Modes Pro upgrade, however, the Dynamic Pro setting wasn’t enabled (it requires a special plugin, similar to Enduro Pro Mode on the R1200GS/A). My XR press bike was also fresh out of the crate. And when I mean fresh, I mean 11-miles-on-the-odometer fresh. As such, the rev limit was restricted from its usual 11,000 redline to somewhere around 9K. And speaking of mud… Our day aboard the XR included intermittent showers, with road surfaces damp and drying, at best, but often they were glistening with freshly-fallen rain. The handful of dirt sections on our 150-mile route were wet as well. The adverse weather and redline restrictions spoiled full engine performance evaluations. However, conditions were ideal for demonstrating the benefit of Rain mode. The relatively mellow throttle was so pleasing that I didn’t venture much out of its safety net on the nasty wet stuff. However, when I did switch into Road Ride Mode everything was drama free thanks to the DTC and ABS Pro systems. The XR proved itself a beast even with its claws retracted. Ample torque churns out across the powerband. The Beemer can crawl along at low rpm no problem, with a potent mid-range getting things moving fast, so there isn’t much need to keep it revving high. In fact, when you do spool it up, which I did on the rare open and (semi)dry patches of road, the XR goes into full-bore – what was that term? Ah, yes – face-blistering mode. The only fault I can find with engine performance was a persistent vibration at around 4000-5000 rpm. But the buzz wasn’t overly irritating and quite easy to forgive when a twist of the grip yields immediate, visceral acceleration. The conditions of the road and bike inhibited my experience, but I’d reckon the XR a more than a worthy match for the Multistrada in terms of engine performance. A six-speed transmission package is highlighted by the Gear Shift Assist Pro, yet another option included in the Premium spec ($475 as stand-alone accessory). Featured on other BMW models, including theR1200RS we’d ride the following day, the shift assist delivers quickshifter upshifts as well as clutch-less downshifts. The XR’s shift assist stood out to me as much smoother in operation than those I’ve sampled on the RS and R1200RT models. The XR’s chassis follows the lead of its S1000R sibling, with some important deviations. A revised steering head angle and longer swingarm stretches the wheelbase to 61 inches, 4.3 inches more than the R model. The aluminum frame’s rear segment has also been strengthened, to support increased load capacity and fulfill the XR’s touring pretentions. The R and XR suspensions share similar hardware (46mm inverted fork and rear shock), but the XR adds 1.2 inches of travel to the front (5.9 inches) and 0.8 inches to the rear (5.5 inches). BMW also offers an optional Dynamic ESA (Electronic Suspension Adjustment) for the S1000XR. The D-ESA system modulates suspension damping based off inputs from sensors measuring acceleration, deceleration and banking angle, with electrically-actuated control valves automatically adjusting the damping rate in real-time. There are two D-ESA settings, Road and Dynamic. Road is the default ESA setting for the Rain and Road Ride Modes, while Dynamic is the default for Dynamic and Dynamic Pro. But riders can override either setting at the push of a button, so you can have Dynamic ESA in Road Ride Mode, or vice versa. Or is it versa vice? Dynamic! If you are scrunching your brow in confusion at all this, then you know what my face looked like inside my helmet as I tried to make sense of it all through a rain-splattered visor. Here’s all you need to know, the fancy electronic crap works. And it works really well too! At first I tip-toed through corners because the roads were so damned slick looking. Plus those Canadian winters beat up the rural roads pretty well and require frequent patching, so surface quality fluctuated as well. But the XR skimmed across everything without care. I noted a stiffening of the suspension when switching to Dynamic for sportier riding, although, again, the weather conditions didn’t cater to crazy balls-to-the-wall riding. The D-ESA suspension does its thing, imperceptibly smoothing and stabilizing. I can’t find fault. But of all the electronic doohickeys festooning the XR, I was most impressed by the ABS Pro. The ABS moniker is a misnomer of sorts, because when I think of ABS it’s in the “oh, $h%T, I gots to stop!” context, where you panic brake and the ABS keeps you from losing traction by obvious interventions that manifest in noticeable pulses at the lever/pedal. No, no, no… This ABS Pro is more like enhanced performance braking. The most noticeable demonstration of the ABS Pro’s advantage is during corner braking, where the bike doesn’t stand up when applying the front brake. Instead the ABS Pro system makes minute modulations to the front brake calipers so that the bike holds its lean angle. As with the XR’s other electronic aids, I was tentative to the test ABS Pro on the soaked road surfaces, but once I did it surprised me with its effectiveness. Sharp corner approaching on a wet road, tip it in, lean it over and squeeze the brakes. The bike slows but doesn’t move from its line. I know that sounds wrong, but that’s what happens. It’s remarkable. And speaking of corners, the XR is quick to tip in and change direction. It claims a 502-pound curb weight, and, if anything, feels even lighter on its toes. It’s a neutral handling bike with an upright riding position and a tall, wide handlebar that provides good leverage. Is it on par with the Multistrada? It’s definitely comparable and I only wish I’d ridden the bike the day after, when the weather was perfect… Still, I was impressed. I was also surprised by its handling off-road. Again, the weather limited our testing options, and we actually skipped one of the planned dirt routes, but we still took a couple easy, graded gravel and dirt roads. I’m no expert off-road, but the XR garnered immediate trust as I futzed with the various settings. Purring along I rapped the throttle and could hear the XR breaking loose, but the effect was barely noticeable at the controls. I twisted the grip again and wiggled the back end, with little controlled fishtails. The ABS works quite well off-road too. Like the GS, the XR’s electronics give you just enough rope not to hang yourself, thus covering my off-road ineptitude… I mean, making me look good without trying. Spoon on some tires with any off-road chops and this XR could do some serious work. But, then again, that’s what the GS/Adventure is for. The truly great thing about the performance and handling of the XR is that it goes about its raucous business in a comfortable manner for the rider. And that’s the crux of why bikes like the Multistrada and, presumably, the XR are growing so popular. They are effectively sportbikes with an upright riding position and relaxed, ADV ergonomics. In fact, the XR ergos are even more relaxing than the RS I rode the day after, or even similar relaxed sportbike options like the Ninja 1000/GSX-S1000F models. The difference maker, for me, is the relatively tall saddle (33.1 inches), which offers greater leg room. Combined with the high handlebar, the XR is perfectly matched to long-legged, tall riders, with even more legroom available via an optional 33.7-inch seat (conversely the XR can be dropped by a 32.3-inch low seat option and further reduced by lowered D-ESA setting to 31.1 inches). The ergos lend themselves to easily standing on the pegs too, a fantastic way to reduce fatigue on long-distance rides. Which begs the question: how would the XR fare as a touring platform? I’d say a pretty impressive one. The half-fairing and the two-position, hand-adjustable screen do a decent job with wind protection. The XR I tested sported discreet, yet effective handguards, with comfort enhanced by the optional heated grips. The only drawback to its touring potential is range. We coaxed it back to Muskoka Lakes with 160 miles on the trip meter, but the reserve light went on at 140 miles, which is poor for a touring rig. Plus those aforementioned engine vibrations would surely get more irritating as the day’s miles dragged on. That being said, the XR’s ergonomics alone make it a tantalizing sport-touring offering – to say nothing about its sporty performance, which will make most purpose built sport-tourers, like it’s R1200RT cousin, seem like heavy, cumbersome louts by comparison. As far as looks go, my first impression of the XR’s styling wasn’t gobsmacked awe, more like “eh… it’s growing on me” acceptance. Something about the curvy beaked front area of the bike disagrees with the little imp on my shoulder who determines my aesthetic tastes. I prefer the blockier look of BMW’s GSA or the stately lines of the R1200RS (the latter of which I tested the following day). I must admit I’m more partial to the XR’s red colorway, where it reminded me an awful lot of the Ducati Multistr… Yeesh, I know, enough already, we get it. 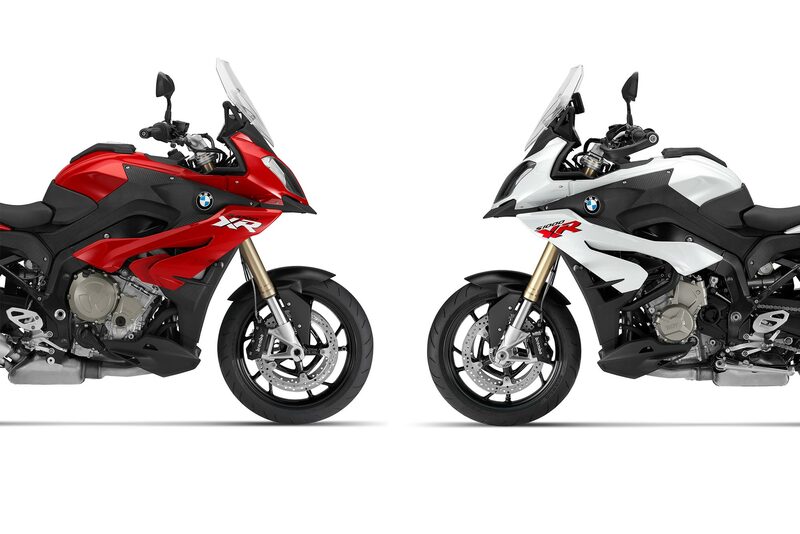 Anyway, in Red or White, the XR’s MSRP requires more explanation than most bikes, as it follows BMW’s protocol of offering several different spec packages straight from the factory, including Base ($16,350), Standard ($17,295) and Premium ($18,750) – the latter package combining Dynamic and Touring packages which can be pieced out separately, I think. The dealer can probably explain the MSRP to you better, as well as the rust-proofing, transport charge, storage surcharge and additional overcharge. Actually, those last ones are jokes (lifted from the inimitable David Puddy), although I think there really is a $495 transport charge. Money! BMW’s decision to take on the Multistrada, and other street-biased Adventure Sports (like the Versys and V-Strom 1000s), with a purpose-built model has two benefits. First, it can be an actual competitor with the Ducati’s bar-raising road performance. Second, it lets the R1200GS remain the GS – an ADV standard bearer that still represents BMW’s most popular and prolific model to date. As for fears that the XR will cut into GS sales, BMW reps were confident the opposite would be true. They foresee the XR as a conquest model that attracts an all-new, younger customer to the German marque, thus following the pattern of its other Inline Four-powered offerings, most notably the S1000RR. The S1000XR’s shift assist stood out to me as much smoother in operation than those I’ve sampled on the RS and R1200RT models. The S1000XR is a sporty handler, with the ABS Pro and Dynamic ESA enhancing road performance. A six-speed transmission package is highlighted by the Gear Shift Assist Pro, yet another option included in the Premium spec ($475 as stand-alone accessory). This ABS Pro is more like enhanced performance braking. The most noticeable demonstration of the ABS Pro’s advantage is during corner braking, where the bike doesn’t stand up when applying the front brake. Instead the ABS Pro system makes minute modulations to the front brake calipers so that the bike’s holds its lean angle. A sophisticated electronics package harnesses the XR’s engine power, as well as integrates actions from the traction control, braking and suspension. The BMW S1000XR performed better than expected off-road, and we spent most of our day on wet dirt…. The BMW S1000XR can venture out into Fire Service roads, where it’s a capable handler, though serious ADV riding will be better served by the GS/A. BMW’s S1000XR mates sportbike performance to Adventure ergonomics.